In 1983 I enlisted in the Georgia Army National Guard. At the time the Army was re-experimenting with a recruiting technique of training members of one state together in what was called "Buddy Platoons". Apparently this idea had been used in the past but had fallen out of favor in recent years. The premise was that all the members of a platoon would go through basic training together. Thus, recruits were assured that their friends who enlisted together from the same town or state would be housed in the same barracks and undergo the same training. This program was open for those who chose basic infantry as their M.O.S. My particular local unit was in Winder, Georgia and specialized in TOW missile, anti-tank defense. We were part of the 1st Battalion, 122nd Infantry and we were attached to the 24th Infantry Rapid Deployment Force stationed at Ft. Stewart, Georgia. During basic training at Ft. Benning , Georgia we trained along side regular Army recruits including those planning to go to the Ranger school at Ft. Benning. Three of the four platoons in our company were "Buddy Platoons". One was from Minnesota, another from South Carolina, ours was from Georgia. 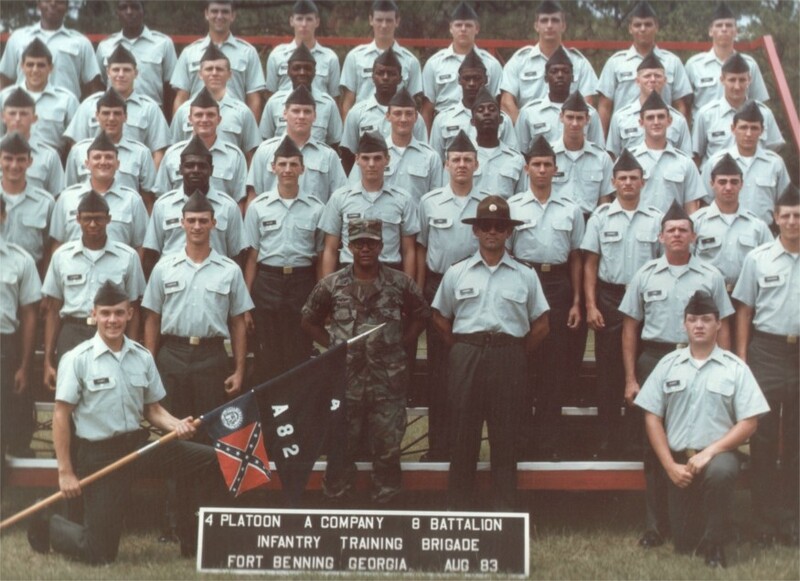 The other platoon was a "mixed" platoon of recruits from various states. Ours was the only platoon of all national guard and all Georgia recruits. This was both an advantage and a disadvantage. Having similar backgrounds helped our comraderie but during the training cycle we encountered the regular Army bias against "NG" recruits. We were derisively referred to as "NO GO's", an insulting acronym for National Guardsmen. Some of the drill sergeants were regular army drills with Vietnam and Korean War experience who were biased against national guardsmen. Over the period of boot camp and advanced infantry training we faced some pretty obvious resentment and prejudice due to our national guard status. However, over the training cycle, we surprised some of our critics by becoming the best platoon in the company. Our platoon drill sergeants used our unique qualities to bolster morale and played it up as an asset, despite the criticism we encountered from the regular army troops and some of the enlisted officers. At the end of the cycle, we emerged as the "honor platoon", which is the platoon that scored highest on all the various "contests" that go with the training cycle. This includes everything from barracks inspections (cleaning toilets and windows) to physical training to throwing hand grenades and rifle marksmanship. In the end, we were denied the award on a technicality. We were told that someone in the battalion commander's office decided that because we graduated a fewer percentage of our original recruits that points should be deducted from our score. Despite our sergeants' complaints that this criteria was an afterthought designed soley to prevent our winning, the ruling stood. However, our sergeants explained to us that we were actually their first all "national guard" platoon and probably one of the first all-Georgia, all national guard, "buddy platoons" to win the most points in the "honor platoon" competition at the 8th Battalion training brigade at Ft. Benning. At our graduation photo, our company's first sergeant, Sgt. France(shown below) and our Company commander Cpt. Curtis Smith along with our primary drills, Sgt. Paradise and Sgt. Theodore J. Walker, acquired a unique item to place on our platoon guide-on (flag). They chose this item to honor our unique status as GEORGIANS and soldiers. Suffice to say, Sgt. France was black as was the company commander. Nothing in this picture was included without their approval. I believe that (then) Staff Sgt. (Platoon Senior Drill Sgt.) Paul J. Paradis Jr. would concur with my assessment. Of our command structure, the three top officers were all black (Company Commander- Capt. Curtis Smith, Executive Officer- 1st Lt. Fred Pugh, and 1st Sgt. -Larry D. France.) Our Senior Drill Sgt. - SFC Albert Hayes was also black (and coincidentally a Waycross, Georgia native.) Our co-lead platoon drill Sgt. Walker was also black. In other words, if this item was offensive to black soldiers, there were plenty of them in position to object. A picture is worth a thousand words. NO one in this photo felt anything but PRIDE. There was NO offense taken by anyone.---Specialist Tony Thompson USANG (inactive).